Perle L. Fouch was born at Burnips Corner, Allegan County, Michigan, March 30,1875, the son of Bilzure B and Rosetta Gregory Fouch. His father was a Private in Company F, 57th Ohio Volunteer Infantry. He was educated in the schools of Michigan, Illinois and Indiana. After finishing his high school, he moved with his parents to Allegan in 1892. Having finished his college education, including a course in law, he was admitted to the Michigan Bar and United States Courts, and commenced the practice of law at Allegan, Michigan, where he has so practiced for the last 50 years. He joined Elisha Mix Camp in May 1898 at Allegan, and most of the members enlisted in the Spanish American War. After some years the Camp went down and another started in Cheshire Township, Allegan County which later failed. Following this, the present Elisha Mix Camp #11 was established and is now (November, 1948) one of the active camps in the Michigan Department. 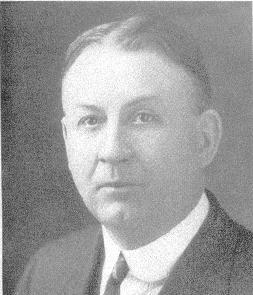 Brother Fouch was elected Department Commander in 1930. He has served the Commandery-in-Chief as National Counselor, Aide to the Commander-in-Chief, and one year as Senior Vice Commander-in-Chief. He also served two years as Commander of the Central Region and on the National Program and Policy Committee.